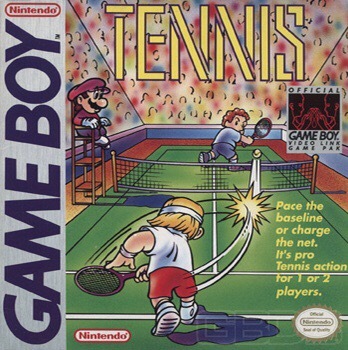 When I picked up Tennis for the original Gameboy is a bit of a mystery, but it was certainly at the very beginning of my university life in late 1990. Buying the Gameboy itself as soon as it launched shortly before I arrived was probably just about dawning on me as an unnecessary extravagance. The money from my Saturday job collecting trolleys at Sainsbury’s was fast transitioning from being a great big lump of pocket money to a minimal living necessity. But in those early days of realising that life costs money, the very late arrival of my student grant, thanks to my Dad’s daily visits to the local council office, was another – albeit very short term – unreality check. And I reckon that’s when I decided I could stretch to a third game (Tetris and Super Mario Land being the other two I got at launch – more on those later), and picked up Tennis. Again, this would soon be seen as another extravagance once the costs of the mandatory course text books – heavy (in both senses) engineering tomes – started to mount up. In fact, thinking about it now, a couple of those at £40-50 each are second only to the Punch 1888 Almanac I bought more recently containing original Jack the Ripper material; now that really was an extravagance! Thank goodness my fledgling university social life was a slow burner at that point, with the role-playing and horror film clubs about as wild as it got… The lead singer of Robed in Desire was definitely still a distant nightmare! I reckon Tennis is one of five games I’ve put more hours into than any others – Destiny, Clash Royale, Elite and Kick Off spring to mind as the probable other four, though I’ve never counted. Surprisingsly. And like Kick Off alone, those hundreds of hours would be spread over many years; in fact, it was coming out for my deconstructed Wimbledon tournament every June well into the 2000’s! The game’s no-fuss title pretty much sums up the game itself. It’s just tennis with no knobs on; the same match, four difficulty levels, over and over again. Presentation is simple (as is the sound), but the gameplay is perfect, and you’ll never have the same match twice thanks to a great AI, and consistent, playable physics that with practice bring a real sense of mastery to the various shot types. There’s great character in the graphics and animations, with a nicely detailed Mario as umpire. 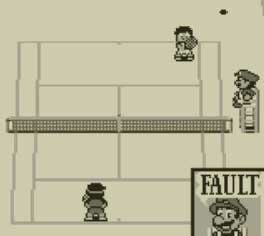 I’ve tried tennis games on all sorts of platforms, and nothing’s ever held my attention like this did and continues to do – I might have retired from imaginary Wimbledon, but every time I get my trusty old Gameboy out I still can’t resist! Hang on, I’ve just remembered the one with Snoopy in the title, but that showdown can come later!